It’s the time for 4th ODI between England and West Indies at Oval on 27th September.You guys might be looking for the best playing 11 team to play in Dream11 League. The best part is we predict the best team to win in Dream11 Fantasy League, Myteam11 and other fantasy cricket playing sites. All details about these teams are completely ” free”. Teams For Dream11 And Similar Sites with Reason. The Pitch of Kennington, Oval, London has a history of high scores, which means it favors the batsman.This pitch has witnessed five 300+ scores in the last tournament and the recent was between India vs Pakistan in champions trophy(I know it’s hard to forget).Anyways let’s focus on current Match Prediction. Good News is we can see the sun tomorrow, so hopefully, there will be no rain and we can watch the full match. Alex Hales and Ben Stokes will not play the 4th ODI as it was reported that Ben Stokes was arrested on Monday. 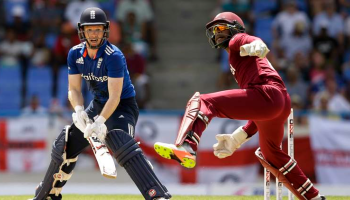 Chris Gayle, Evin Lewis, Shai Hope (w), Marlon Samuels, Jason Mohammed, Rovman Powell, Jason Holder (c), Ashley Nurse, Devendra Bishoo, Jerome Taylor, Miguel Cummins. Sai Hope comes to bat at 1st down and he is an emerging player. His previous two match score was 35 runs and a catch in the 1st ODI and in 2nd ODI his score was 20 runs and a wicket behind the wickets. As Butler bats at late order i.e 4th down and he has less opportunity to bat.He did not come to bat in the 1st ODI but had contributed with 2 wickets behind the wicket.In 2nd ODI he scored 2 runs and 2 wickets behind the wicket. I am choosing 5 batsmen because as I mentioned earlier it’s a batting pitch. His previous match contribution was 54 runs and took 2 catches in the 1st ODI.In 2nd ODI he scored 84 runs. Though Morgan has not contributed much in previous two games, everyone knows his potential so it’s hard to ignore him, if you want to win the Dream11 fantasy league. His contribution in last two games was 37 runs and 94 runs. 100 runs and 13 runs were Bairstow’s scores in last two games. He didn’t play in the last games but as Alex Hales was involved in an incident he will play in the 4th ODI and his potential is known to everyone. Holder Scored 41 runs in the 1st ODI and 34 runs in 2nd ODI and took 2 wickets and a catch. Ali didn’t get the chance to bat in the first match but he took a wicket and scored 102 runs in the second match. Rashid took two wickets in the 1st ODI and 3 Wickets in the 3rd ODI and scored 9 runs as well. Plunkett contributed with 5 wickets and 9 runs in the 3rd ODI. Taylor took 2 wickets in last 2 matches.He was consistent and has the ability to take more wickets that’s why we have selected him in Playing 11 of the dream11 team. Hey Thanks for your effort. It really helped me.